The Guild hosts an annual event known as Peasant’s Revel. This event usually takes place on a Saturday in July. An ideal first event for people new to medieval re-creation, it is also a fun day for returning attendees. 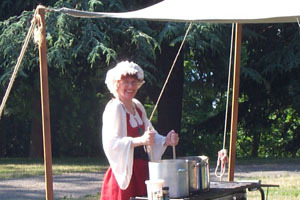 The event features down-and-dirty peasant games, including those authentic medieval favorites: the fritter-carry race, the wet-rag-on-a-stick dance, and the spit-in-the-bucket relay. 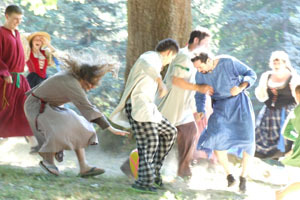 There is also dancing, socializing, pastimes for children, and – we believe – the only cheese rolling done outside of England. The event closes with an outdoor meal of bread and cheese and a hearty soup cooked on-site by the Guild.